Beans is a fiber rich vegetable. 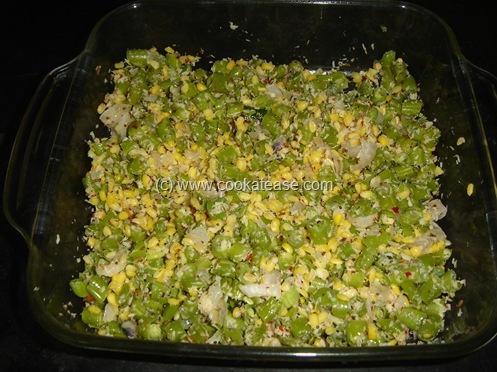 There are so many varieties of side dishes prepared with beans. 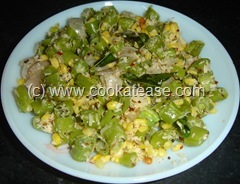 Here I prepared ‘Beans Poriyal’ a traditional south Indian side dish. 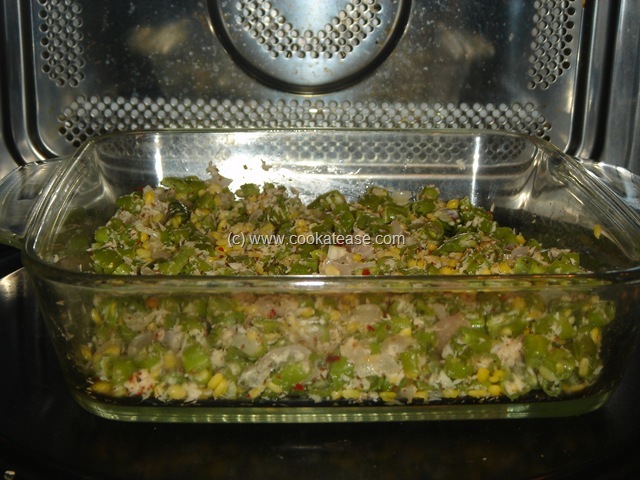 Less spice is used and I prepared it in microwave fully. 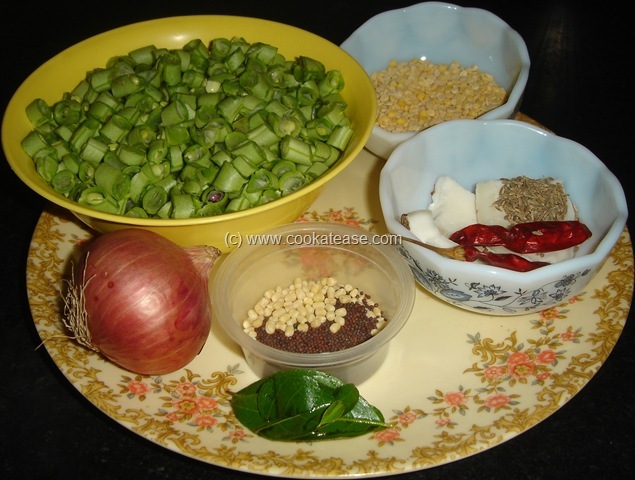 “Poriyal” is a Tamil word used to indicate a stir fried dish with less spices. Micro cooking need some practice and is important to follow safety standards. I love micro cooking because it takes very less oil and time to cook. Micro cooking retains the colour of the vegetable and you can avoid over cooking too. You need few vessels to cook. 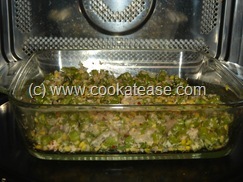 In micro cooking according to the quantity to be cooked, the cooking time varies. I cooked this dish in 100% micro power. I did the whole cooking in 100% microwave power. I used two micro proof dishes; one square and a small dish. 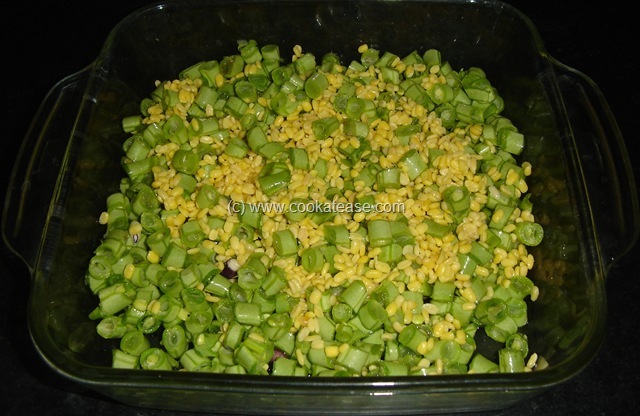 Soak green gram for 15 minutes; wash and chop beans,onion; dry grind the items given in a mixer. 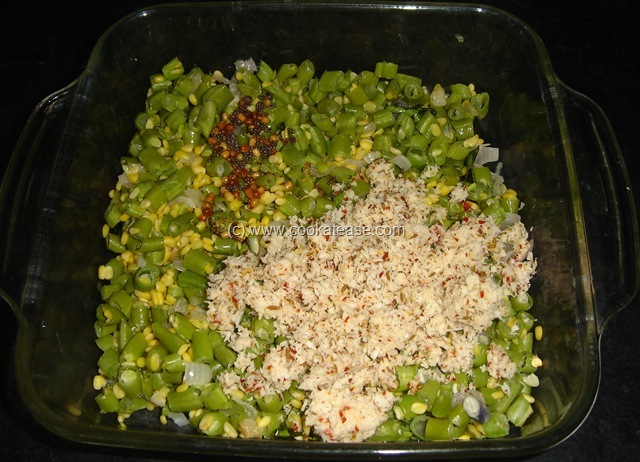 In a micro proof vessel, put chopped beans, soaked green gram and sprinkle handful of water; cover partially and cook, in microwave on high for 8 minutes; stir in between at 3 minutes interval; after 6 minutes add salt, mix and cook for remaining 2 minutes; transfer this into a bowl. 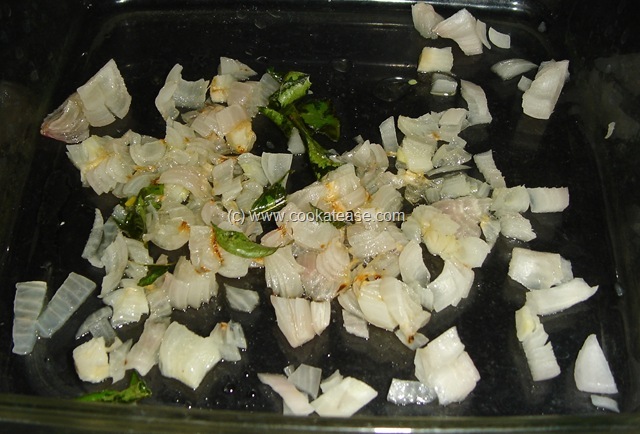 In the same micro proof vessel, add one tea spoon of oil, cut onion, curry leaves; cover partially, cook in microwave on high for 3 minutes and remove. 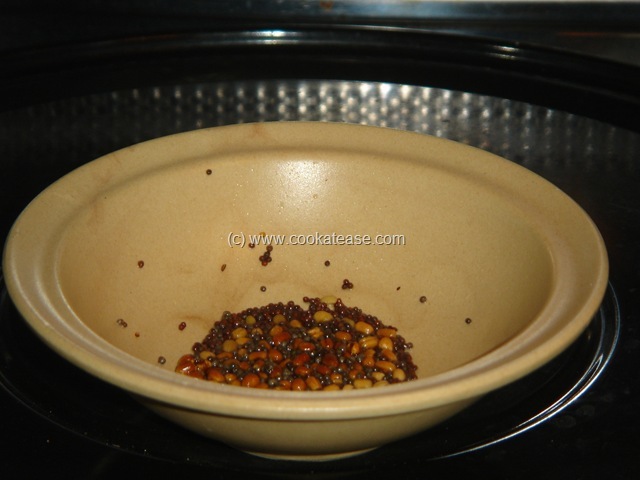 In a small micro proof vessel put mustard, urad dal and 3 to 4 drops of oil; mix, close partially and cook in microwave on high for 3 minutes. In the micro proof vessel, add this seasoning, cooked beans, dry ground coconut with fried onion and curry leaves; mix well, keep in microwave on high for one minute. 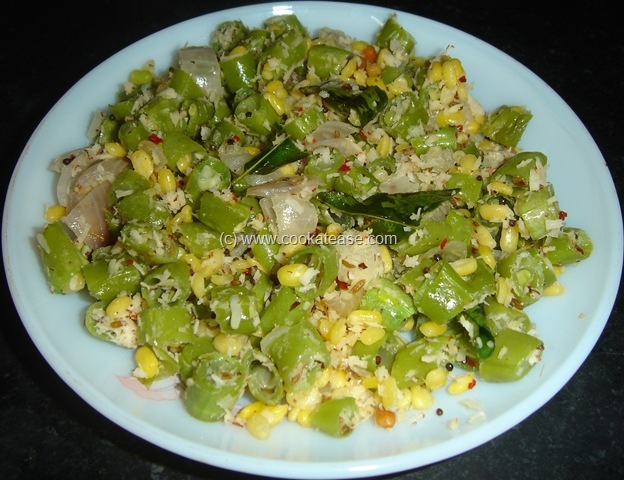 Now Beans Poriyal is ready. It took only 15 minutes for this. 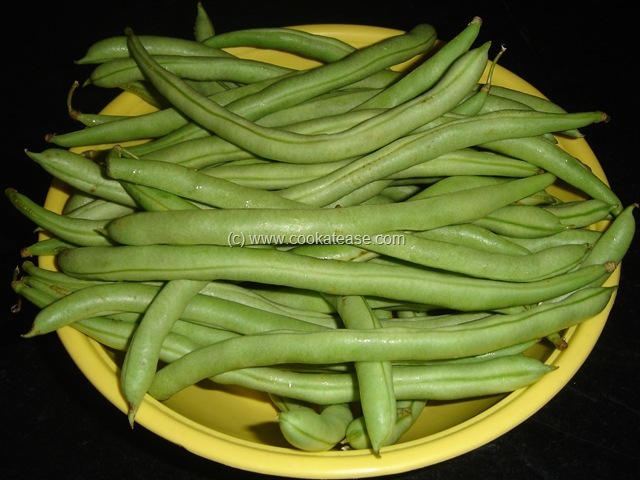 Cluster beans, cabbage and broad beans can also be cooked like this. This post is part of the event “My Legume Love affair (MLLA) – 20th Edition” hosted by Rachel of The Crispy Cook and scheduled by My Legume Love Affair – The Host Line Up by Susan, The Well-Seasoned Cook. I love this recipe for its spices and how healthy and beautiful it is. Thanks for contributing it to My Legume Love Affair #20. Wow they look so delicious n colorful!